New Birkdale Clinic is a leader in plastic surgery in the North West, admired for its experience and expertise at both its Rotherham and Liverpool locations. Having held over 10,000 successful consultations, they are renowned for breast enlargements, but also perform tummy tucks, liposuctions and facelifts – helping their clients to feel comfortable and beautiful. They have recently added Plasma Elite, Derma Pen and Thread Lifts to their non-surgical treatment offering in order to meet the evolving demands of the market, and cater to those who’d rather not go under the knife. 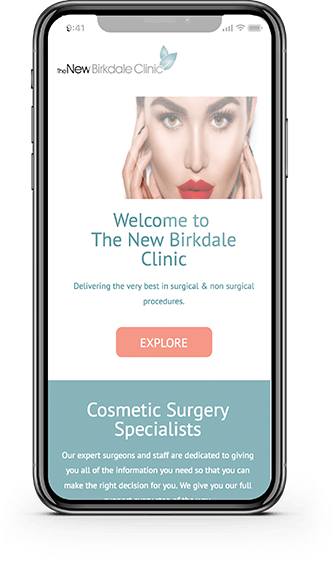 When we started working with New Birkdale Clinic in 2016, their online presence did not at all reflect the expert surgeons, the excellent customer care, and the professional service that New Birkdale Clinic provide to their clients. Instead, their website was incredibly slow, had blank pages, the menu was difficult to navigate, the images were low quality, and the content was poorly written. Their social media strategy was also lacking, with ad hoc, irrelevant posts, amateur artwork and the occasional spelling mistake. In an industry that needs to build trust, demonstrate to their clients that they are in the safest hands, and make their clients look and feel beautiful, this was hugely affecting the number of people that were booking consultations. 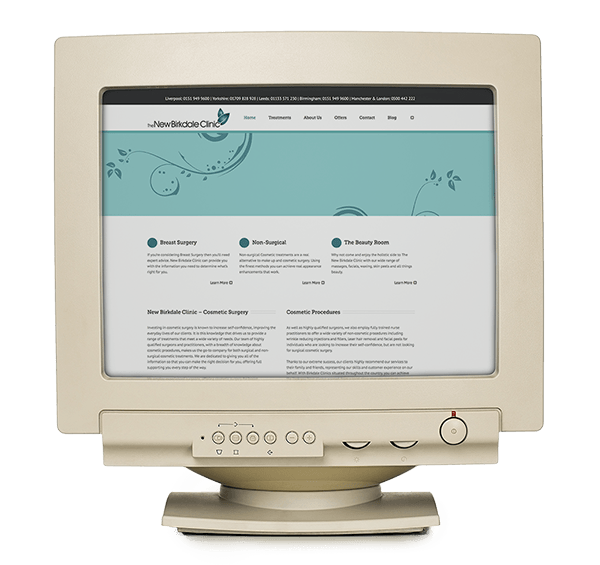 So, we gave their website a face lift, beautified their social media strategy, and boosted their organic search rankings. We completely redesigned the website, creating a brand new site map that would compliment the new SEO strategy. The majority of NBC’s traffic comes from mobile devices, so the journey on mobile was considered from the beginning of the design process. We made sure it was quick and easy for users to contact either of the clinics, either by calling them or via the contact form. The New Birkdale Clinic brand colours are white and turquoise which are fresh, clean and attractive, so we maintained this colour palette, adding in the warm, peachy skin colour as the bright call to action. The key service that NBC provide is discounted breast augmentation surgery, along with other offers such as half price rhinoplasty. Because these offers are so crucial to the business, they are front and centre of the new website. The promotional offers on the home page are editable, so the offers available at the time can be displayed. The content on the old website was thin, poor quality and did not provide enough of the information that the user would require when investigating cosmetic surgery. We added detailed treatment pages that go through the procedures, patient suitability, post-surgery expectations and overall benefits, a feature that was missing from the previous website. We also added a blog that delved into more detail about specific procedures, answering frequently asked questions. These both improved the user experience on the website and provided a great foundation for the new SEO campaign. Our social media strategy includes running several Facebook & Instagram ads continuously to promote the offers and the blog content. These have not only increased the engagement with the Instagram and Facebook pages, but they have increased conversions, with bookings being made via DM and also by users coming to the website from those ads and booking a consultation there. We took over the email marketing for the client, first growing the database by adding a MailChimp plug in to the website to allow those making enquiries on the contact form to add themselves to our mailing list, and sending out bimonthly emails promoting special offers, detailing surgeon availability, and sharing the blog content. An explosion in website traffic, with approximately 43,100 visitors the past year, each spending 2.5 minutes on the website, suggesting real engagement. 11, 600 website conversions, 252 of which came through social media. Ranked Position 1 on Google for: ‘Cheap Breast Enlargement’, ‘Breast Enlargement Liverpool / Rotherham’, ‘Breast Augmentation Liverpool’, ‘Breast Augmentation Offers’ and ‘Cosmetic Surgery Rotherham’ among other key search terms. 3,000+ Facebook Likes; 1500+ Twitter Followers; 300+ Instagram Followers.